Welcome to the new Tokyo where your sickest fantasies are for sale and every fetish has a face. Saiga's a burnt out war photographer slumming in the tabloid wasteland sent to dig up some dirt on the underground elite. He stumbles upon a depraved ceremony below the city and learns just how filthy people can get. With a tragic young beauty named Kagura in tow, Saiga flees his enemies and his own inner demons. A single kiss has ignited a chain of events that could force the entire ruling class to their knees. Smile for the camera...Or perish in its lens. Subjectively, as a fan of anime, Speed Grapher was an enjoyable experience for me. The story utilized an intriguing concept, the main antagonist was fascinating and anything with poppy eighties music used as a theme song is going to earn some brownie points with me. As a reviewer however, there were times when Speed Grapher left much to be desired. Allow me to extrapolate; and I will do so by stating the finer points of this anime first. As was stated in the outset, Speed Grapher applies some very interesting themes and motifs all throughout the series. 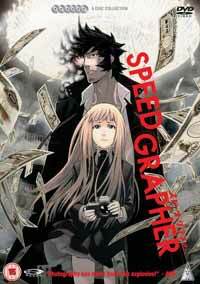 If one word was to be used to aptly key out what the theme of Speed Grapher is, it would be decadence. This anime discusses the downfall of a society due to depravity acting as the catalyst, and what could happen if hedonism becomes the primary virtue of the social narrative. The 'club' that Saiga is sent to investigate seems like it was taken right out of Stanley Kubrick's Eyes Wide Shut. Just more frank in its presentation and less artsy. Outside of the club, things are not much better; licentiousness runs rampant with underground prostitution, greed, and out-of-control economic mismanagement. Sound familiar? It should, since this is what is happening in several societies around the world. This is why Speed Grapher is such an intriguing series, and actually is frightening at times. An interesting cautionary tale. On the other side of the coin, the idea of a pleasure centric society is fascinating to explore, but this anime suffers from a case of the idea being better than the overall execution. When Saiga is given the powers of 'the goddess' and thus is now able to use his camera as a weapon, he saves Kagura from her prison, and is now flung into the role of protector as the baddies send euphoric after euphoric to take him down. This leads to the monster-of-the-week trope which can be fun at times, but when used in a work that is supposed to act as a warning against compulsive pleasure-seeking and greed, it cheapens the message. However, the altercations are entertaining and seeing the imaginative display of the different euphoric's powers come into play, which uses their desires as the basis for their super human abilities; it is the silver lining in an anime that would otherwise be a fight fest. Animation is also not a strong point in Speed Grapher. Being a GONZO studio production, there are moments where the animation quality dips and this weakness has been seen in some of their other works such as Welcome to the NHK and Samurai 7. Character action usually does not extend past wooden movement, and the frame rates are lower than some of the more fluid anime out there. As for the other technical aspects of Speed Grapher, the music is catchy and utilizes some poppy synthesis sounds that are ubiquitous of the eighties. The style of music also comes into play in regards to the opening theme which is Duran Duran's, Girls on Film. Unfortunately this opening theme cannot be heard on the American release of this series due to copyright issues. What a shame. Admittedly, Saiga is not the most interesting protagonist. He's a two dimensional hero with a heart of gold, a sad past, a gruff disposition. It would all be so riveting if more was done with him. Little reasons were given as to why the viewer should care about him. The antagonist, Suitengu, on the other hand, is much more fascinating. Here is a villain that is interesting, sympathetic, and so manipulative that he has an entire nations economy controlled by his charisma. One of the amusing aspects of this character is the fact that he has so much money, all of his cigarettes are composed of ten thousand yen bills. Reminds me of a wealthy man who told me he was so rich that he used all of his one dollar bills as toilet paper (actually, that never happened). Recommended Audience: Though not strictly pornographic, Speed Grapher tries its darned hardest to be at times and will thus be completely inappropriate for children. Many episodes also contain graphic violence and disturbing dismemberment, while both the English soundtrack and the subtitles available on the R1 DVD have strong profanity.